i’ve not been in the mood to go food-shopping over the past few weeks. i think it’s a combination of being busy which means i’d have to shop during the really busy times or at the end of the day when i just don’t have the energy; and feeling a little bit broke so having all my favourite shopping places off limits until payday. as a result i’ve steadily been working my way through the cupboards and freezer looking for meals that don’t require a trip to the shops. or if they do it’s for nothing more than some fresh herbs and salad. this weekend, featured the last of my “i don’t wanna shop” meals - i’m now out of fresh vegetables and garlic so need to hit the shops. they all focused around puff pastry, a couple of packets of which i always keep in the freezer (i know i should try making my own but it’s not that high on the list). four tarts, in three days, is what’s happening - not bad for a girl who’s not a pastry fan! 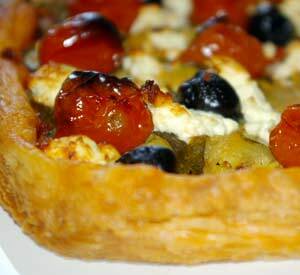 this courgette, lemon and feta tart with roasted cherry tomatoes is what we had yesterday. it was delicious and i’ll be making it again for friends who’re coming for an early supper tomorrow evening. heat the oven to 220c. mix the cherry tomatoes with 1 teaspoon of olive oil and put these in the oven to roast while you prepare everything. heat the remaining teaspoon of olive oil and fry the garlic until it starts to brown. add the courgettes and chilli, cover and cook until the courgettes are soft and starting to break down (it’ll take c15 minutes and you’ll need to stir them every few minutes). when the courgettes are ready take the lid off the pan and turn the heat up to boil away any liquid that’s left – you don’t want soggy pastry! add the basil and lemon zest, season well and leave to cool. roll out your pastry to fit a baking tray then score a “frame” around the edge so a crust can rise and form a border to the tart. spread the sundried tomato paste over the pastry, within the central square. top with the warm courgette mix. sprinkle with feta, olives and the roasted cherry tomatoes (which should now be slightly softened). i like tarts like this served at room temperature or you could eat it hot. we had it with a salad, some crusty bread and a lovely bottle of english wine!